The 2003 season made it clear that the Red Sox needed to upgrade their pitching. They did just that in the offseason acquiring Curt Schilling and Keith Foulke. The closer by committee theory was dead as Keith Foulke was now the closer. Foulke was good in the regular season in 2004 but he was great in the postseason. The Red Sox don't win it all without him yet when Sox fans call out the heroes of that postseason he is often forgotten. 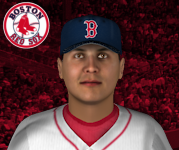 Foulke pitched 14 innings in the 2004 postseason, gave up 7 hits, struck out 19 batters and only gave up 1 run. He finished 8 games in that postseason including all four World Series games. The final out of Game 4 will live on forever. Here is the clip. The 2005 season for Foulke wasn't a good one. His ERA ballooned to 5.32. It all came crashing down on June 28th against the Indians. The Red Sox had an 8-5 lead going into the 8th inning. Foulke entered the game with one out in the 8th inning and over the next inning and two-thirds he would give up four hits and five runs. The Red Sox would go on to lose 12-8. You can view the boxscore here. He made Johnny from Burger King famous. Foulke would never be the same but it doesn't take away what he did in 2004. Feeling nostalgic for that 2004 Red Sox team I started a 2004 season on Out of the Park Baseball. I am taking the role of Tito Francona to see if I can lead those idiots to the World Series title. Opening Day didn't go as planned especially for Keith Foulke. Can you imagine if this is how he started his career with the Red Sox? Below is the write up of the simulated game. All that was missing was a great quote from Foulke. The Baltimore Orioles ushered in the 2004 season with a win versus the Boston Red Sox at Oriole Park at Camden Yards. The final score was 4-2. Starting Pitcher Sidney Ponson was named player of the game. Baltimore reliever Todd Williams picked up the win, bumping his record to 1-0. Keith Foulke was collared with the loss. Baltimore took a 3-2 lead in the bottom of the eighth inning. With one out, catcher Javy Lopez hit a solo home run that set the crowd abuzz. "We cashed in when we had the chance," said Baltimore manager .